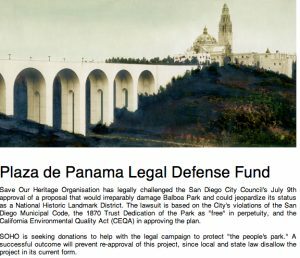 The city of San Diego will pay $355,000 to a preservationist group that sued to stop a plan that would have resulted in construction of a bridge in the west side of Balboa Park, according to city documents obtained. The settlement reimburses the Save Our Heritage Organisation for attorney’s fees incurred during a court battle. 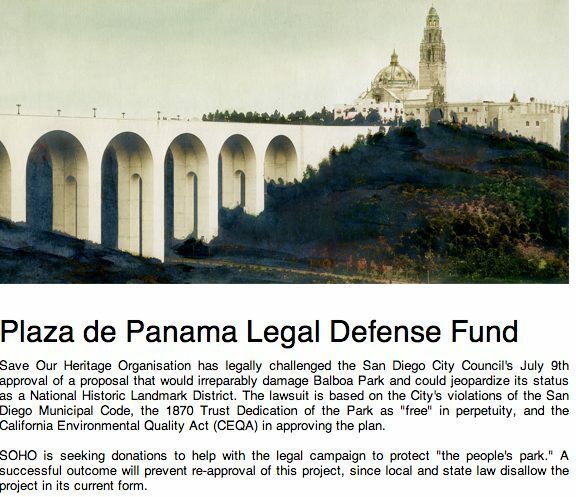 Posting on the Save Our Heritage Organisation website seeking donation for Balboa Park case. The City Council approved the deal in closed session last month and is scheduled to give final approval in open session on Tuesday. SOHO disputed a plan by ex-Mayor Jerry Sanders and Qualcomm co-founder Irwin Jacobs to remove vehicle traffic from the heart of Balboa Park in the Plaza de Panama. The Sanders-Jacobs plan called for the addition of a bypass bridge that would have carried cars away from the plaza, along with construction of a parking garage. SOHO contended the bridge would be unsightly and take away from the historical character of the park. In February 2013, a Superior Court judge ruled that the council members had no evidence to support a finding that the project area would have no reasonable beneficial use if the plan wasn’t approved. The finding was necessary because of the park’s historic status. The court’s ruling effectively killed the plan. The mayor at the time, Bob Filner, subsequently ordered parking in the plaza to be removed. Traffic in the plaza has been reduced this year by a seismic retrofit project on the Cabrillo Bridge.